Jaypee Institute of Information Technology, Noida has advertised in THE HINDUSTAN TIMES newspaper for recruitment of Teaching Faculty jobs vacancies. Interested and eligible job aspirants are requested to walk-in 21st, 28th July 2018 & 04th August 2018. Check out further more details below. About College: Dr. A.P.J. 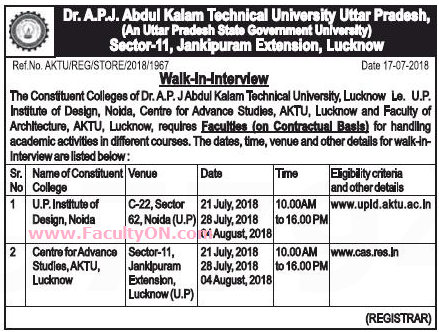 Abdul Kalam Technical University (AKTU)(formerly UPTU) was established by the Government of Uttar Pradesh, vide Act Amendment No. 1156(2) LXXIX-V-1-15-1(Ka), 24-2015 dated Sept 9, 2015 Uttar Pradesh Adhiniyam Sankhya 23 of 2000. Under the University Act, ‘Technical Education’ includes programmes of education, research and training in Engineering, Technology, Architecture, Town Planning, Pharmacy, Applied Arts & Crafts and such other programmes and areas that the central Government may in consultation with All India Council for Technical Education (AICTE) by notification in Gazette declare. Different Courses. Visit official website for more details. How to Apply: Interested and eligible candidates are requested to attend the Walk-in interview along with CV, originals & copies of certificates and recent PP size photo to the following walk-in address given below.